Once the AP Computer Science Principles Exam is over, you can continue encouraging student learning and engagement in your classroom through Pluralsight One's special partnership with Code.org. Students who participate in Code.org’s AP Computer Science Principles curriculum can continue to develop the skills they've spent the year building with free access to the Pluralsight course library designed especially for Code.org students. These courses allow your students to dive deeper into many of the concepts introduced in CS Principles. 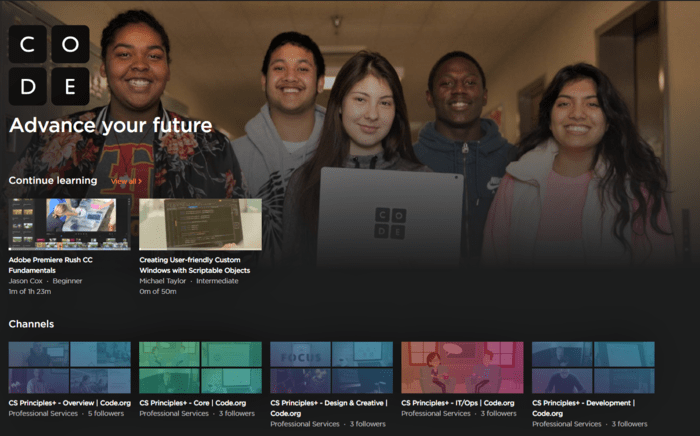 Curated by expert technologists, the library features over 150 courses totaling over 500 hours of content across four major areas: IT/OPs, software development, design/creative, and product management. As the AP CS Principles exam approaches, Code.org teachers will be notified through email newsletters on how to get access the Pluralsight One offering. Pluralsight is an enterprise technology skills platform that delivers a unified, end-to-end learning experience for businesses across the globe. Through a subscription service, companies are empowered to move at the speed of technology, increasing proficiency, innovation and efficiency. Founded in 2004 and trusted by Fortune 500 companies, Pluralsight provides members with on-demand access to a digital ecosystem of learning tools, including Pluralsight IQ, directed learning paths, expert-authored courses, interactive labs, and analytics. For more information, visit www.pluralsight.com. Pluralsight One is Pluralsight’s social enterprise. It is the company’s commitment to drive significant, lasting social impact by improving equal access to technology skills and investing in catalytic solutions. For more information about Pluralsight One, visit www.pluralsightone.org.